Android 6.0 Marshmallow introduces a new power saving feature called ‘Doze’. A device enters Doze when the user leaves it unplugged and stationary for a period of time and with the screen off. When this happens, the system defers application activity to save power. It will periodically and briefly resume normal operations, called an idle maintenance window, in order to perform app syncing and other pending operations. If your app uses Google Cloud Messaging (GCM), you will need to take into account the following behaviors for users whose devices are in Doze. GCM has two priority types for messages, called high priority and normal priority. When using high priority, GCM attempts to deliver messages immediately, waking a device in Doze, as needed. With Android Marshmallow, nothing changes here. The most important change is that messages will be batched for devices in Doze. When the device enters its idle maintenance window, the batch of messages will be received. We discard messages whose time_to_live expires while the device is in Doze (including TTL=0). Despite this, it is recommended that, unless absolutely necessary, you keep your notifications as normal priority ones, as this will minimize battery impact. They will still sync during doze mode as described above, and of course once the device exits Doze. High priority messages should only be used by applications that need to generate an immediate notification to the end user such as a chat app notification or an incoming phone call. 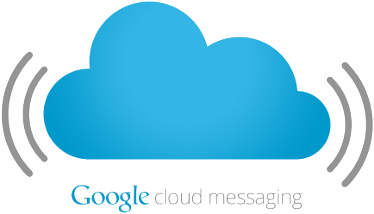 To learn more about Google Cloud Messaging message priorities, visit the Google Developers site. Editor’s note: We’ve been talking to developers to find out how they’ve been achieving success on Google Play. We recently spoke to Reko Ukko at Finnish mobile game developer, Seriously, to find out how to successfully use Notifications. 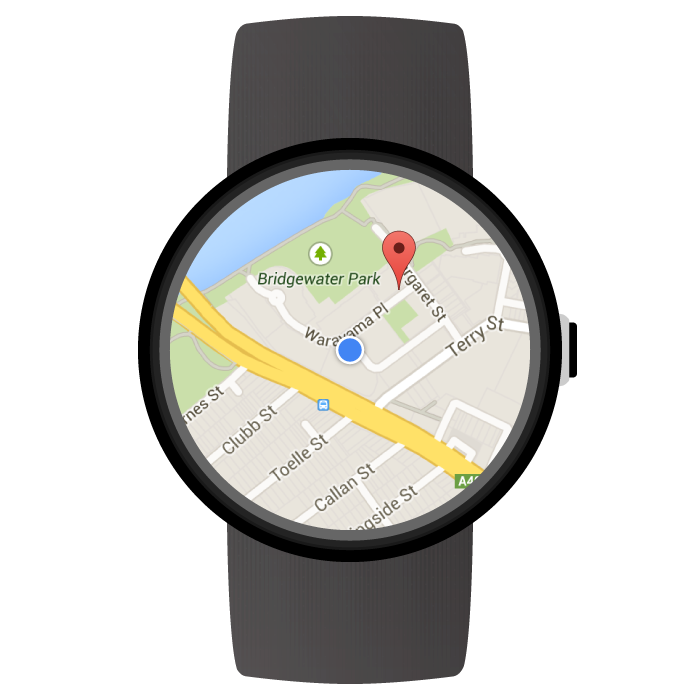 Notifications on Android let you send timely, relevant, and actionable information to your users' devices. When used correctly, notifications can increase the value of your app or game and drive ongoing engagement. Seriously is a Finnish mobile game developer focused on creating entertaining games with quality user experiences. They use push notifications to drive engagement with their players, such as helping players progress to the next level when they’ve left the app after getting stuck. Reko Ukko, VP of Game Design at Seriously, shared his tips with us on how to use notifications to increase the value of your game and drive ongoing engagement. Do let the user get familiar with your service and its benefits before asking for permission to send notifications. Don’t treat your users as if they’re all the same - identify and group them so you can push notifications that are relevant to their actions within your app. Do include actionable context. If it looks like a player is stuck on a level, send them a tip to encourage action. Don’t spam push notifications or interrupt game play. Get an understanding of the right frequency for your audience to fit the game. Do consider re-activation. If the player thoroughly completes a game loop and could be interested in playing again, think about using a notification. Look at timing this shortly after the player exits the game. Don’t just target players at all hours of the day. Choose moments when players typically play games – early morning commutes, lunch breaks, the end of the work day, and in the evening before sleeping. Take time zones into account. Do deep link from the notification to where the user expects to go to based on the message. For example. if the notification is about "do action X in the game now to win", link to where that action can take place. Don’t forget to expire the notifications if they’re time-limited or associated with an event. You can also recycle the same notification ID to avoid stacking notifications for the user. Do try to make an emotional connection with the player by reflecting the style, characters, and atmosphere of your game in the notification. If the player is emotionally connected to your game, they’ll appreciate your notifications and be more likely to engage. Don’t leave notifications up to guess work. Experiment with A/B testing and iterate to compare how different notifications affect engagement and user behavior in your app. Go beyond measuring app opening metrics – identify and respond to user behavior. Experiment with notifications yourself to understand what’s best for your players and your game. You can power your own notifications with Google Cloud Messaging, which is free, cross platform, reliable, and thoughtful about battery usage. Find out more about developing Notifications on Android. Google Play services 7.8 - Let’s see what’s Nearby! Today we’ve finished the roll-out of Google Play services 7.8. In this release, we’ve added two new APIs. The Nearby Messages API allows you to build simple interactions between nearby devices and people, while the Mobile Vision API helps you create apps that make sense of the visual world, using real-time on-device vision technology. 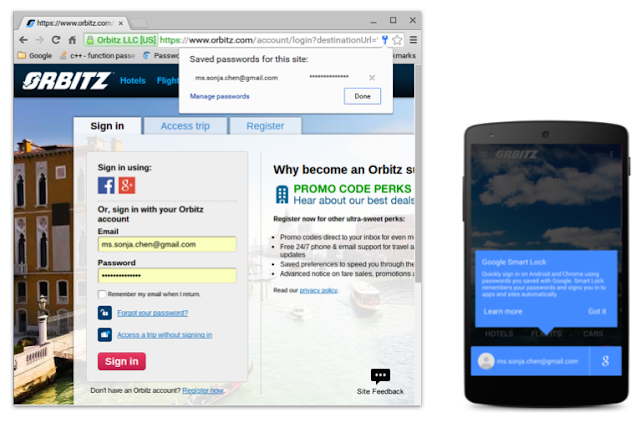 We’ve also added optimization and new features to existing APIs. Check out the highlights in the video or read about them below. Nearby Messages introduces a cross-platform API to find and communicate with mobile devices and beacons, based on proximity. Nearby uses a combination of Bluetooth, Wi-Fi, and an ultrasonic audio modem to connect devices. And it works across Android and iOS. For more info on Nearby Messages, check out the documentation and the launch blog post. We’re happy to announce a new Mobile Vision API. Mobile Vision has two components. The Face API allows developers to find human faces in images and video. It’s faster, more accurate and provides more information than the Android FaceDetector.Face API. It finds faces in any orientation, allows developers to find landmarks such as the eyes, nose, and mouth, and identifies faces that are smiling and/or have their eyes open. 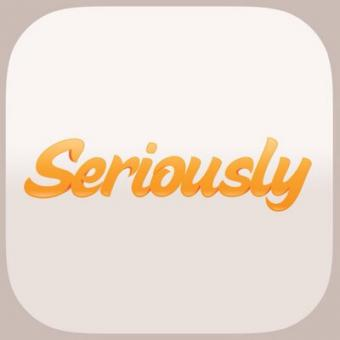 Applications include photography, games, and hands-free user interfaces. The Barcode API allows apps to recognize barcodes in real-time, on device, in any orientation. It supports a range of barcodes and can detect multiple barcodes at once. For more information, check out the Mobile Vision documentation. And finally, Google Cloud Messaging - Google’s simple and reliable messaging service - has expanded notification to support localization for Android. When composing the notification from the server, set the appropriate body_loc_key, body_loc_args, title_loc_key, and title_loc_args. GCM will handle displaying the notification based on current device locale, which saves you having to figure out which messages to display on which devices! Check out the docs for more info. And getting ready for the Android M release, we've added high and normal priority to GCM messaging, giving you additional control over message delivery through GCM. Set messages that need immediate users attention to high priority, e.g., chat message alert, incoming voice call alert. And keep the remaining messages at normal priority so that it can be handled in the most battery efficient way without impeding your app performance. To learn more about Google Play services and the APIs available to you through it, visit our documentation on Google Developers. Developers from all segments are increasingly relying on Google Cloud Messaging (GCM) to handle their messaging needs and make sure that their apps stay battery-friendly. GCM has been experiencing incredible momentum, with more than 100,000 apps registered, 700,000 QPS, and 300% QPS growth over the past year. At Google I/O we announced the general availability of several GCM capabilities, including the GCM Cloud Connection Server, User Notifications, and a new API called Delivery Receipt. This post highlights the new features and how you can use them in your apps. You can watch these and other GCM announcements at our I/O presentation. XMPP-based Cloud Connection Server (CCS) provides a persistent, asynchronous, bidirectional connection to Google servers. You can use the connection to send and receive messages between your server and your users' GCM-connected devices. Apps can now send upstream messages using CCS, without needing to manage network connections. This helps keep battery and data usage to a minimum. You can establish up to 100 XMPP connections and have up to 100 outstanding messages per connection. CCS is available for both Android and Chrome. Nowadays users have multiple devices and hence receive notifications multiple times. This can reduce notifications from being a useful feature to being an annoyance. Thankfully, the GCM User Notifications API provides a convenient way to reach all devices for a user and help you synchronise notifications including dismissals - when the user dismisses a notification on one device, the notification disappears automatically from all the other devices. User Notifications is available on both HTTP and XMPP. When sending messages to a device, a common request from developers is to get more insight on the state of the message and to know if it was delivered. This is now available using CCS with the new Delivery Receipt API. A receipt is sent as soon as the message is sent to the endpoint, and you can also use upstream for app level delivery receipt. If you’re already using GCM, you can take advantage of these new features right away. If you haven't used GCM yet, you’ll be surprised at how easy it is to set up — get started today! And remember, GCM is completely free no matter how big your messaging needs are. To learn more about GCM and its new features — CCS, user notifications, and Delivery Receipt — take a look at the I/O Bytes video below and read our developer documentation. 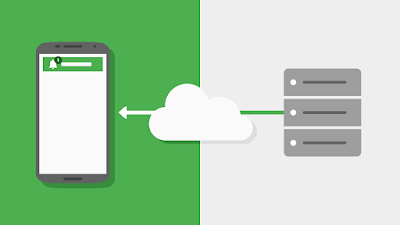 Android Studio lets you easily add a cloud backend to your application, right from your IDE. 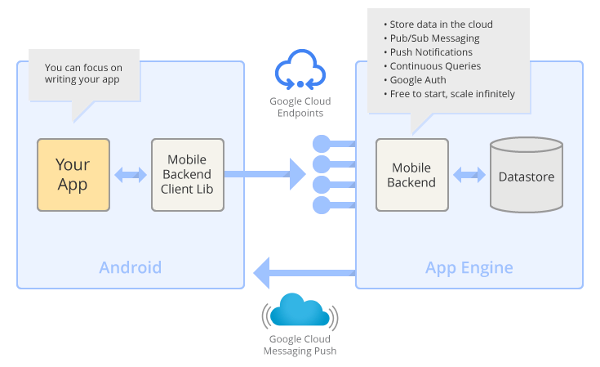 A backend allows you to implement functionality such as backing up user data to the cloud, serving content to client apps, real-time interactions, sending push notifications through Google Cloud Messaging for Android (GCM), and more. Additionally, having your application’s backend hosted on Google App Engine means that you can focus on what the cloud application does, without having to worry about administration, reliability or scalability. When you create a backend using Android Studio, it generates a new App Engine application under the same project, and gives your Android application the necessary libraries and a sample activity to interact with that backend. Support for GCM is built-in, making it easy to sync data across multiple devices. Once you've generated the project, you can build and run your client and server code together, in a single environment, and even deploy your backend code right from Android Studio. In this post we’ll focus on how to get started with the basic setup. From there it's easy to extend the basic setup to meet your needs. If you'll be running the app on an emulator, download the Google APIs Addon from the SDK Manager and run your app on that image. In Android Studio, open an existing Android application that you want to modify, or create a new one. Select the Android app module under the Project node. Then click Tools > Google Cloud Endpoints > Create App Engine Backend. In the wizard, enter the Project ID, Project Number, and API Key of your Cloud project. A Google Cloud Endpoint (DeviceInfoEndpoint.java, auto-generated from DeviceInfo.java) that your Android app will “register” itself through. Your backend will use that registration info to send a push notification to the device. A sample endpoint, MessageEndpoint.java, to list previously sent GCM messages and send new ones. A starter web frontend application (index.html in webapp directory) that will show all the devices that have registered with your service, and a form to send them a GCM notification. A RegisterActivity.java class that, when invoked, will go through the GCM registration flow and also register itself with the recently created backend through DeviceInfoEndpoint. Client libraries, so that the application can talk to the backend using an object rather than directly using raw REST calls. XML files related to the newly created activity. In your Android application, you can call RegisterActivity whenever you want the registration to take place (for example, from within the onCreate() method of your main activity. When you're ready to deploy an update to your ( the sample ) production backend in the cloud, you can do that easily from the IDE. Click on the “Maven Projects” button on the right edge of the IDE, under Plugins > App Engine, right-click and run the appengine:update goal. As soon as the update is deployed, you can also access your endpoints through the APIs Explorer at http://<project-id>.appspot.com/_ah/api/explorer. For testing and debugging, you can also run your backend server locally without having to deploy your changes to the production backend. To run the backend locally, just set the value of LOCAL_ANDROID_RUN to true in CloudEndpointUtils.java in the App Engine module. Now build and run your Android app. If you called RegisterActivity from within your main activity, the device will register itself with the GCM service and the App Engine app you just deployed. If you are running the app on an emulator, note that GCM functionality requires the Google APIs Addon image, which you can download from the SDK Manager. You can access your sample web console on any browser at http://<project-id>.appspot.com. There, you will see that the app you just started has registered with the backend. Fill out the form and send a message to see GCM in action! It's easy to expand your cloud services right in Android Studio. You can add new server-side code and through Android Studio instantly generate your own custom endpoints to access those services from your Android app.